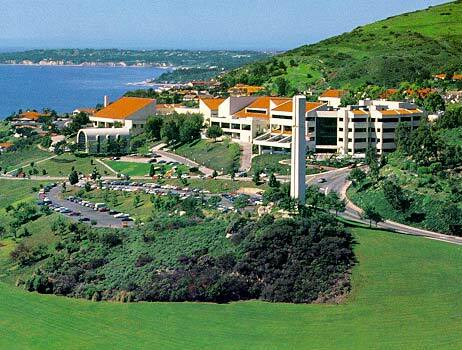 Pepperdine University Communication Division at Seaver College is located in Los Angeles County, California. Pepperdine is an independent, highly conservative, private Christian university that is associated with the Churches of Christ. The school’s 830-acre Malibu campus overlooks the Pacific Ocean and has one of the most spectacular views of any university in the world. In addition to the Malibu campus, which is home to Seaver College, Pepperdine has several other campuses in California, as well as campuses in Europe, South America and Asia. Pepperdine’s Communication Division concentrates on communication theories along with rhetorical strategies and practical learning. Speech, debate, newspaper and magazine production, communication consulting and television production are all areas of focus for undergraduate studies. As a Christian university, the school also emphasizes ethics. Students are encouraged to use what they learn at Pepperdine to seek an understanding of God’s will for them and to build purposeful lives filled with service to him and their communities. All students complete internships with major organizations, and many go on to become permanent employees at those organizations. Pepperdine offers on-campus housing in a suburban environment. The campus is set high above the coastline in Malibu. Its most prominent symbol is an enormous cross that announces the school’s dedication to the Christian tradition that inspired founder George Pepperdine to establish what was originally a small Christian college in 1937. The school’s athletic teams are known collectively as the Waves. They compete in the West Coast Conference against other schools that have religious affiliations. U.S. News & World Report has ranked Pepperdine 53rd in the nation, while Forbes has ranked it 104th, and Washington Monthly has declared it 137th. On a slightly different note, the Princeton Review included Pepperdine twice in its list of schools with “Dorms Like Palaces,” and named it their “Most Beautiful Campus” for two years in a row. The publication also counted it among schools offering a “High Quality of Life.” For some prospective students, however, the school’s inclusion as number 13 on the Princeton Review’s “Alternative Lifestyles not an Alternative” list may serve as a deterrent. Pepperdine’s Communication Division provides students the opportunity to study for a Bachelor of Arts degree in Communication with special emphasis in a number of areas, including journalism, organizational communication, rhetoric and leadership, and media production. All students, regardless of the major they choose, are required to take multidisciplinary courses in order to build a firm foundation in the liberal arts. A Master of Arts program is available, as is a Master of Science. An accelerated Master of Arts in Communication, as well as an accelerated Master of Arts in Media Production is available to undergraduate students who meet the program’s stringent requirements, including maintaining a minimal grade point average. Students who are enrolled in this program take a year’s worth of graduate-level courses as undergraduates, allowing them to complete a Master of Arts program in one year. The Communication Division also offers a certificate in conflict management as an enhancement to communication or other degrees.